Hello to all my painting friends. Looks like fall is just around the corner. The mornings are chilly and there's a nip in the air. Soon the trees will change colors and we will be surrounded in a sea of yellow, gold and red. It is a beautiful time of year in this area. My studio classes are filling up again, and that too is a sure sign that autumn is arriving. Many of you have written to me wishing I could bring my painting classes to you by way of instructional DVDs. So plans are percolating to do just that. We have the cameras, the lighting gear, and the microphones so now I just have to design some new course materials. It's going to be a very busy fall and winter! The last few weeks have not been as productive as I would have liked, but life does happen and sometimes all our best efforts are thwarted. I was really hoping for a new look for the website by now but that hasn't happened yet. However, I do have the design ready so you should see a change soon. I'm keeping this newsletter short as usual and I'll be in touch again in a few weeks. Do you read PaintWorks magazine? 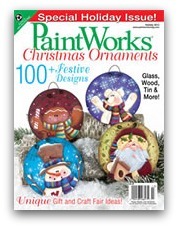 The Annual Christmas Ornaments issue of PaintWorks magazine is now available. As I mentioned in the last newsletter, one of my designs is featured in that issue. There are so many other beautiful projects to paint in time for the Holidays in this issue as well. Why not pick up a copy today. We love having you as a member of our club. It is so nice to stay in touch with folks who share an interest in tole and decorative art. And of course membership has its privileges. In this issue of The Creative Chronicles, I'm pleased to provide you with a free pattern packet just for being a member of the club. In keeping with our autumn colors theme I am giving you Sunburst Colors On Clear Glass Plate. To claim your free packet all you have to do is visit our website, Click the "Add To Cart" button, then apply Discount Code… freesunburst then click on the "Update Cart" button and "Checkout" to get your packet for FREE. But you will have to hurry since the discount coupon will expire September 30 at midnight. I have silver plated trays and teapots that I would like to paint for decorative purposes. However, they are not pre-primed. What is the proper way of preparing a silver-plated surface for painting? Being that it is a porous surface should I be using spray paint? Here's my reply: Silver-plated surfaces are treated the same way as all metal objects. They are actually non-porous so proper preparations are of the utmost importance. Before you do anything else wash the items with dish detergent, rinse it and quickly dry it. If there are ornate details, these could trap moisture so use a hairdryer to ensure every section is completely dry. Now you have to sand the object. Use an emery cloth or 200-grit sandpaper all over the surface. This is going to create the necessary "tooth" for the primer to stick to. Whether you spray or brush on the sealer, you need to sand the object first. I like to use Jo Sonja's All Purpose Sealer . I apply one coat and wait for it to dry and then I add another coat. I've also used Krylon Primer with great success, just be sure to follow the manufacturer's instructions. Now you have to cure this first coating or film. Find a warm space and let air cure for 2 to 4 weeks. Humid conditions will require a longer cure time. A speedier drying time can be achieved if your item can fit in your home oven. Set the temperature to 200F, place the item inside for 20 minutes. Turn off the oven, open the door and let the item cool to room temperature before handling it. When cured, basecoat with your choice of top quality acrylic paints and proceed with your painting. Finish with a minimum of 2 coats of Jo Sonja's Water Based Polyurethane Varnish in your choice of sheens. Time will harden your painted projects to a very durable finish. All of these film layers will stay tender for many weeks, so handle them with care. 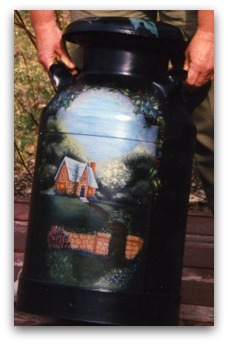 The photo above is of an antique milk can that I painted for my mother almost 20 years ago. Just so you know, there is not a scratch on it even though it's on display in a high traffic area. So don't be afraid to paint on any metal object! Once fully hardened your project will stand the test of time! The design on the milk can is by Yvonne Kresal from her book Cottages from Pumpkin Ridge volume II. Do you enjoy our newsletter? Share it with your friends and encourage them to join the club and enjoy the benefits. Remember, your feedback is really important since it guides me in delivering what you feel is most important to you, so stay in touch.